La Loge des Avocats price per day from € 135 . Appart Coeur de Lyon - Part Dieu - Halles/Dussaussoy price per day from € 69 Located in the heart of Lyon’s 6th district just a 10-minute walk away from Lyon Part-Dieu Shopping centre, Appart Coeur de Lyon - Part Dieu - Halles/Dussaussoy features a self-catering studio with free Wi-Fi. The studio comes with a cinema-themed decoration, a flat-screen TV with DVD player and seating area. To prepare their meals, guests can use the fully equipped kitchen with Nespresso coffee machine, microwave and oven..
Digital Appartement Mi Hotel . Cordelier Suites price per day from € 95 . Best Western Lyon Saint-Antoine price per day from € 71 . 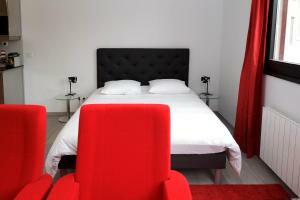 Berlioz Nn Lyon price per day from € 88 . 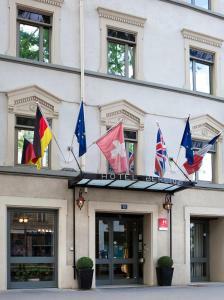 Sofitel Lyon Bellecour price per day from € 151 . Hôtel Le Roosevelt price per day from € 89 . 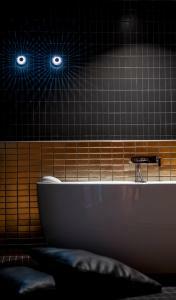 Hotel Victoria Lyon Perrache Confluence price per day from € 49 . 6. Continue onto Bd du Jeu de Paume. 7. Continue onto Bd de l'Observatoire. 8. Turn left onto Bd Victor Hugo. 9. Continue onto Tunnel de la Comédie. 10. Turn right onto Allée Henri II de Montmorency. 11. Turn right onto Bd d'Antigone. 12. Continue onto Bd de l'Aéroport international. 13. Continue onto Av. Pierre Mendès-France. 16. Take the exit on the left toward Lyon-Centre. 17. Merge onto Quai Docteur Gailleton. 18. Keep left to stay on Quai Docteur Gailleton. 19. Continue onto Quai Jules Courmont. 20. Turn left onto Pl. des Cordeliers. 21. Take the 3rd right onto Rue de la République. Cathedral Saint Jean Baptiste, Lyon, 2.1 km from the centre of town of Lyon. Museum Miniature et Cinema, Lyon, 2.1 km from the centre of town of Lyon. Museum des Miniatures et decors de cinema - Maison des Avocats, Lyon, 2.1 km from the centre of town of Lyon. Art Museum Beaux-Arts, Lyon, 2.3 km from the centre of town of Lyon. Museum Civilisation Gallo-Romaine, Lyon, 2.5 km from the centre of town of Lyon. Basilica Notre Dame de Fourviere, Lyon, 2.5 km from the centre of town of Lyon. Park de la Tete d'Or, Lyon, 3.6 km from the centre of town of Lyon. Ski resort Chalmazel, number of ski pistes: 9. 78 km from town of Lyon. Ski resort Autrans, altitude: 1650m. 84 km from town of Lyon. Ski resort Corrençon en Vercors, altitude: 2170m. 96 km from town of Lyon.